The tiny Caribbean island of Anguilla is one of those eye-poppingly beautiful places that you can’t quite believe exists. Just a short hop from Antigua, it is encircled by platinum-white beaches with an exclusive yet laidback feel. It’s perfect for honeymooners who crave lazy days on the beach, barefoot gourmet dining in waterfront restaurants and cool, contemporary hotels. The British Territory of Anguilla is one of the Caribbean’s ultimate beach honeymoon destinations – a little treasure measuring less than 35 square miles and home to just 15,000 people. There are no less than 33 pristine white sand beaches with tempting crystal clear turquoise waters, a contemporary style, breathtaking views in every direction and mouth-watering cuisine. It’s hard to imagine a more romantic Caribbean honeymoon destination. 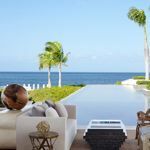 You won’t find high-rise chain hotels in Anguilla – instead, you will find a dazzling choice of luxury hotels and spa resorts, slick villas, modern apartments, small boutique hotels, inns and guesthouses. We have selected four favourite beachfront hideaways. 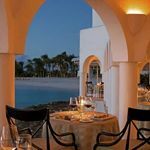 Stylish Belmond Cap Juluca, with its Moorish architecture and sublime service, the sophisticated Four Seasons (honeymooners love the Rooftop Suites with private pool) and CuisinArt Golf Resort & Spa, with its stunning infinity pool and sublime Venus spa. Last but by no means least is Malliouhana, transformed from its former faded grandeur to reopen in December 2018 as one of the Caribbean’s most stylish boutique hotels. When it comes to eating out, you are spoilt for choice. The island has over 100 restaurants offering international and local cuisine. We particularly love the historic Sandy Ground, which comes alive at night with toes-in-the-sand dining and relaxed cocktail bars where you can dance the night away. Anguilla’s beaches and coves are enviably unspoilt, uncrowded and recognised by many as some of the world’s best. You’ll find it easy to find a spot just for the two of you. It’s not just about the beaches though – explore Anguilla’s galleries and tour historic sites and museums that catalogue the island’s history. For the more energetic, there is horseback riding, tennis, sailing and golf at the CuisinArt 18 hole championship course. Find out more on the Anguilla Tourist Board‘s own website. Find out more about our honeymoons in Anguilla.